Thank you and many mahalos to the hundreds of loyal customers. 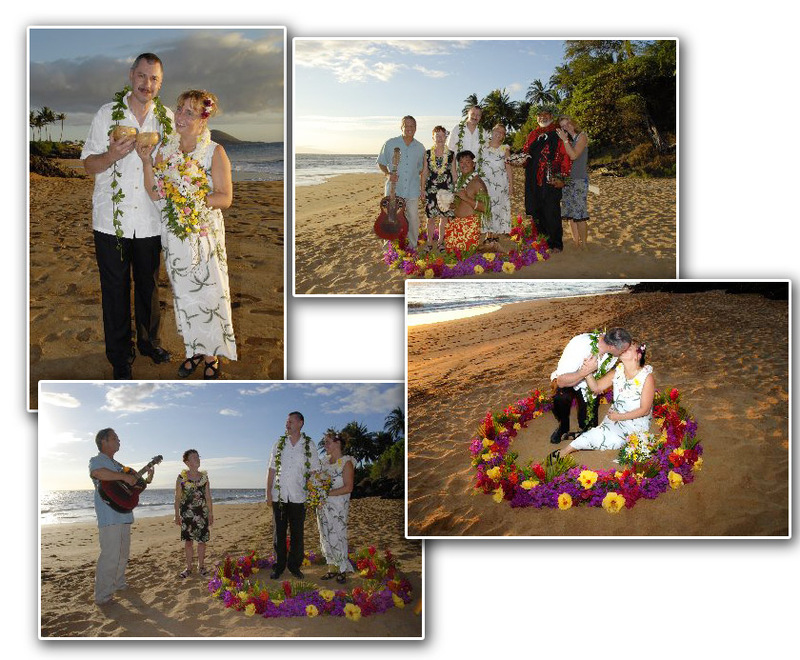 Click on their images below to enlarge their photographs. 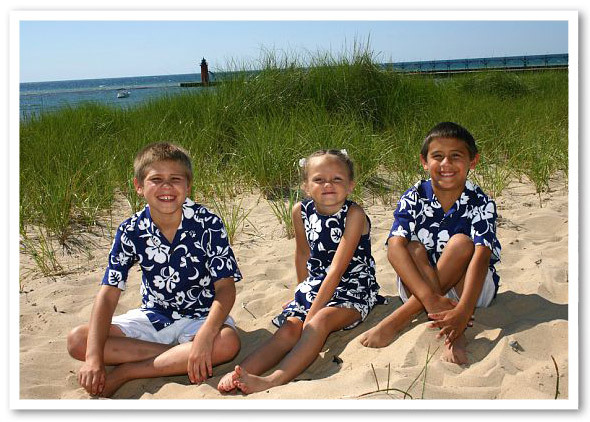 Please send your photos and stories to mauiman@mauishirts.com. They will be pulbished here. Please include your name, city and state. 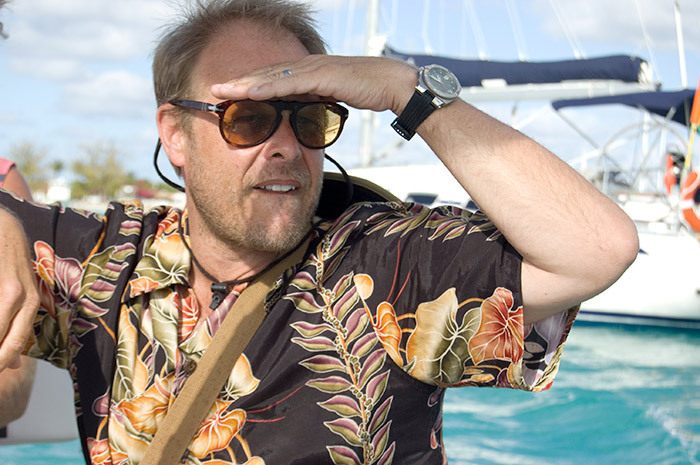 Alton Brown is wearing a men's Anthurium Kamehameha short-sleeved shirt. Enclosed are two photos of me in your shirts. 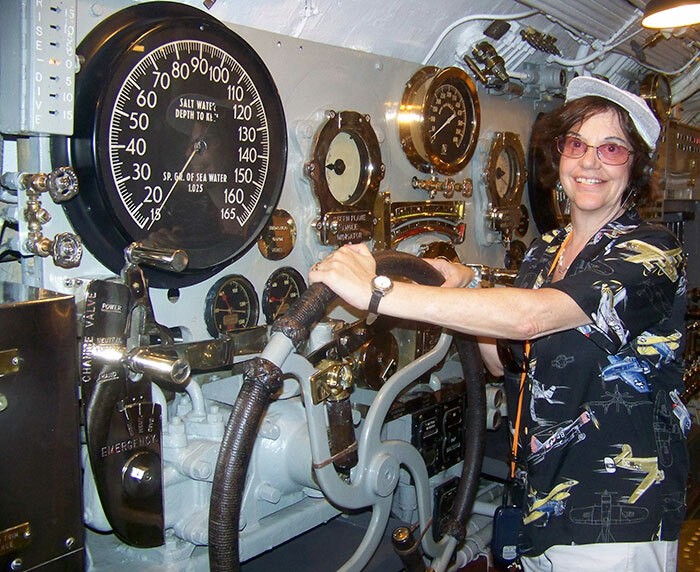 The first, in Fighter Planes, was taken on board the USS Bowfin submarine in Pearl Harbor in July, 08. Ping! Ping! Aooga! Dive! 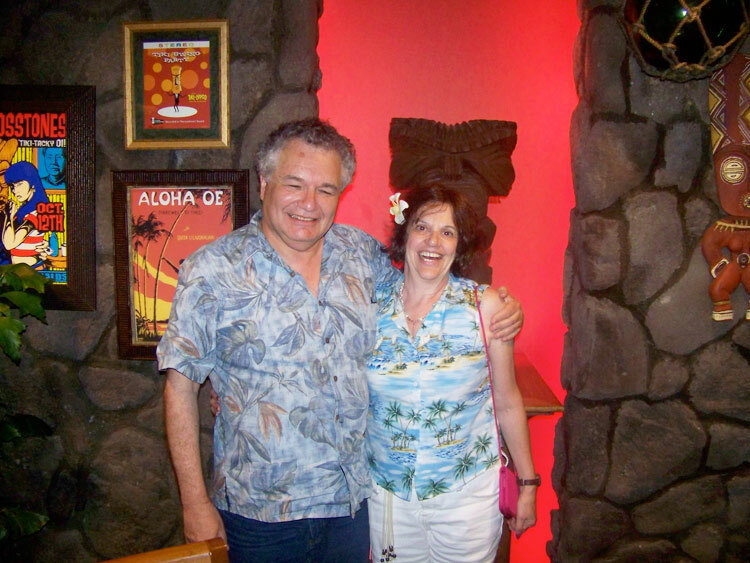 The next (I think the shirt is Polynesian Island) was taken at the totally tacky Tiki's Restaurant in Waikiki the next day. Sorry hubby's shirt is not one of yours. Incidentally, two weeks ago I was at a Sarah Palin rally in Carson, CA, waiting with 10,000 other people to get in, when a sweet elderly lady tapped me on the shoulder. "My husband flew one of those planes on your shirt," she said, indicating a smiling gent in a WWII veteran's cap. "It was the P-24." Wow! It's not just a shirt - it's a piece of history. I love these shirts and wear them as often as possible. Thankfully, in SoCal we wear Hawaiian shirts all year long ... but I'd still rather be "at home in the islands", as the Bros. Cazimero say. 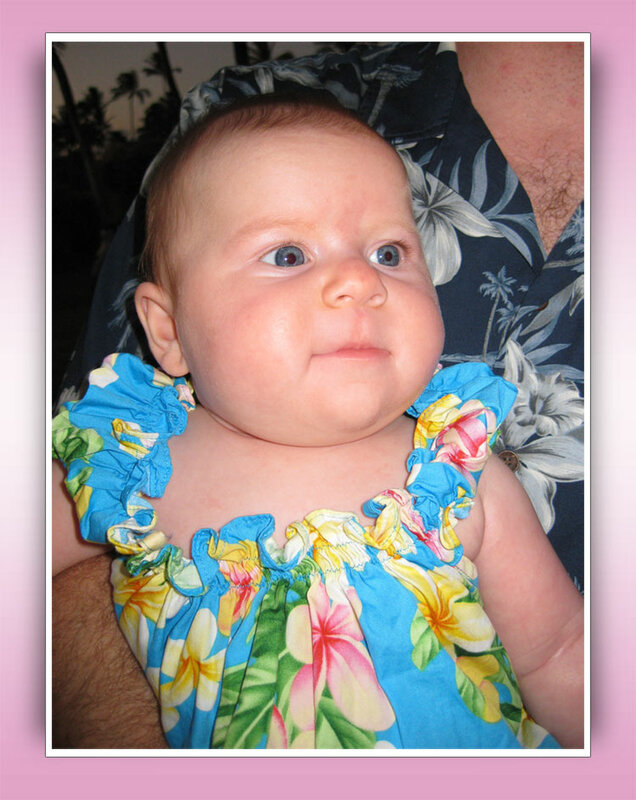 Lilliana Grace, the baby is wearing a Maui Plumeria infants 2 pc set. 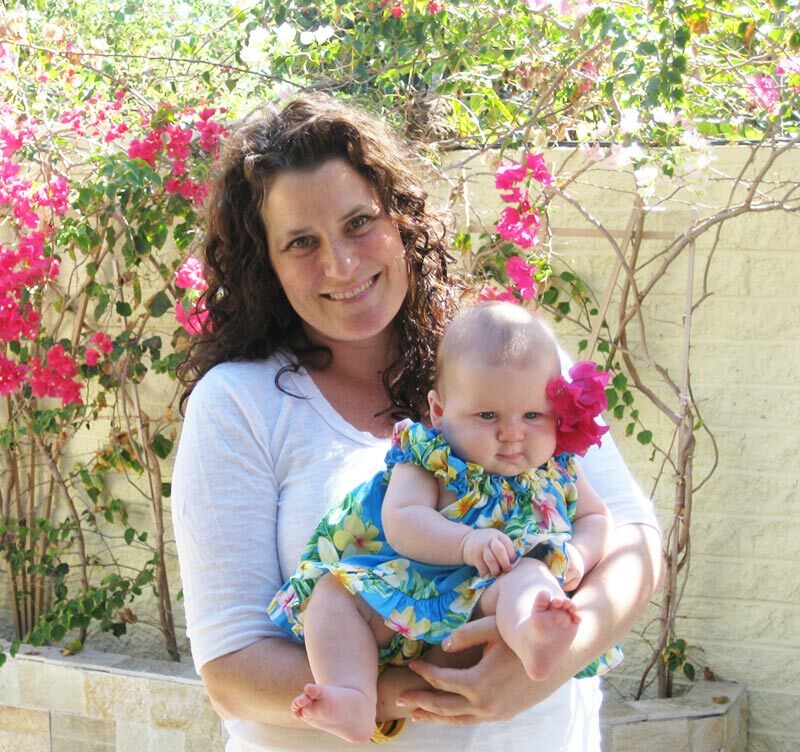 ... here is a picture of Lilliana Grace Heymann (age 4 1/2 months) in Kailua, Oahu on 9/21/08 -- she is pictured here with me (her mom). 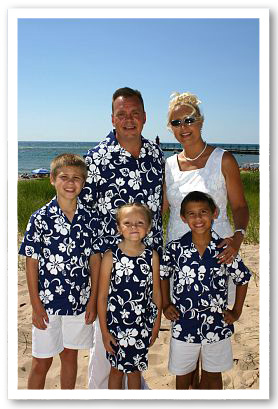 The Csabai family is wearing Plumeria Island matching family outfits. 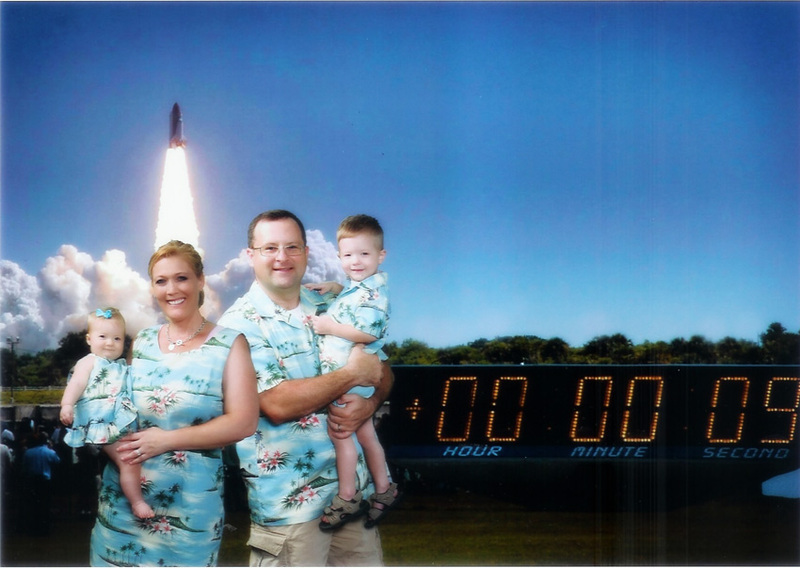 Today we went to Kennedy Space Center and wore our matching family outfits. 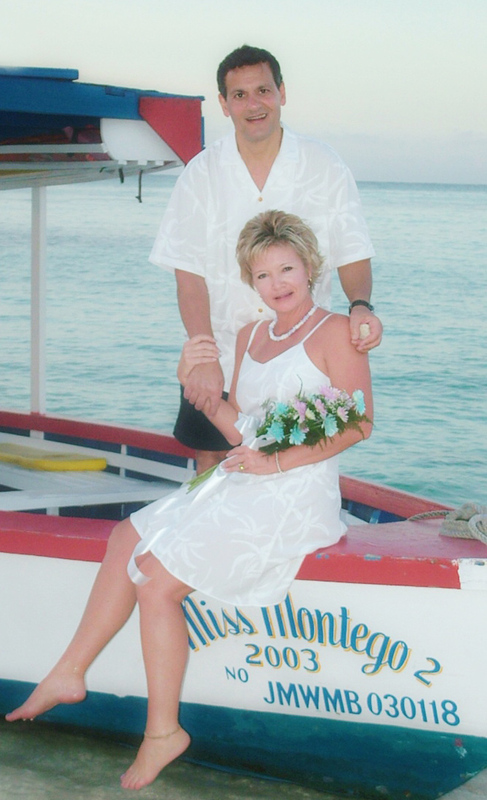 We had a photo taken and wanted to share with you the lovely photo. We received so many compliments and everyone asked where we purchased these from. I just wanted you to know that we told so many families today where we got these. Sounds like more business is headed your way soon! Congratulations Mike and Melissa Zuest. The groom is wearing a Hurricane White on White men's shirt. 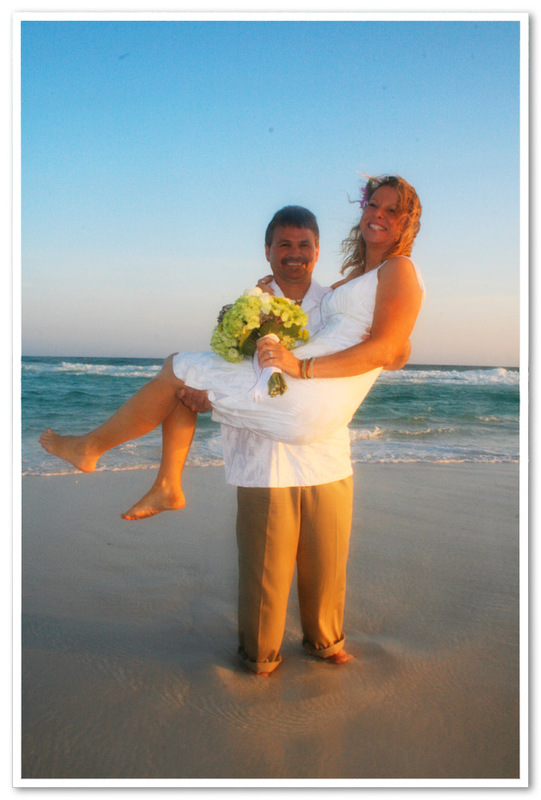 The bride is wearing a wedding Hurricane White on White sarong dress. The Groomsmen are wearing matching Hurricane Green and White Trees. I wanted to thank you for taking such good care of my order (and timely returns for those that were the wrong size)! 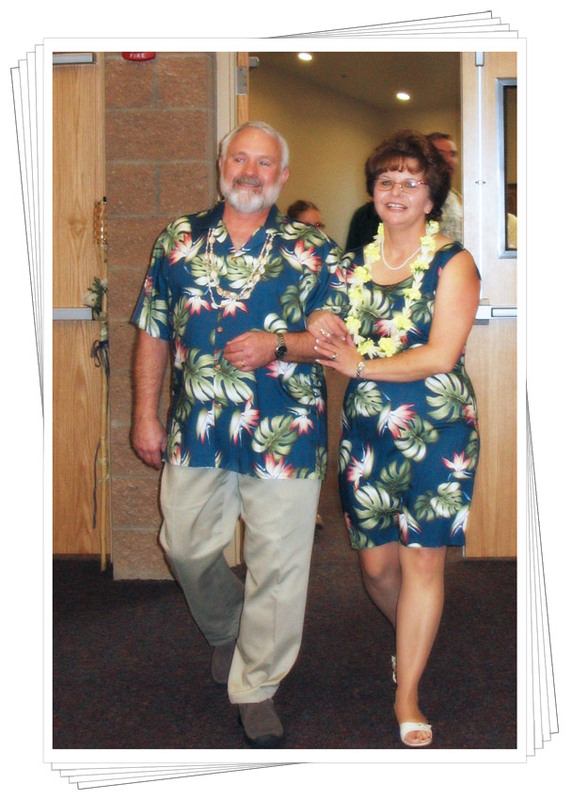 The wedding was awesome - and we looked great - thanks to you and your great service! When my friends ask where we got our attire, I certainly tell them! 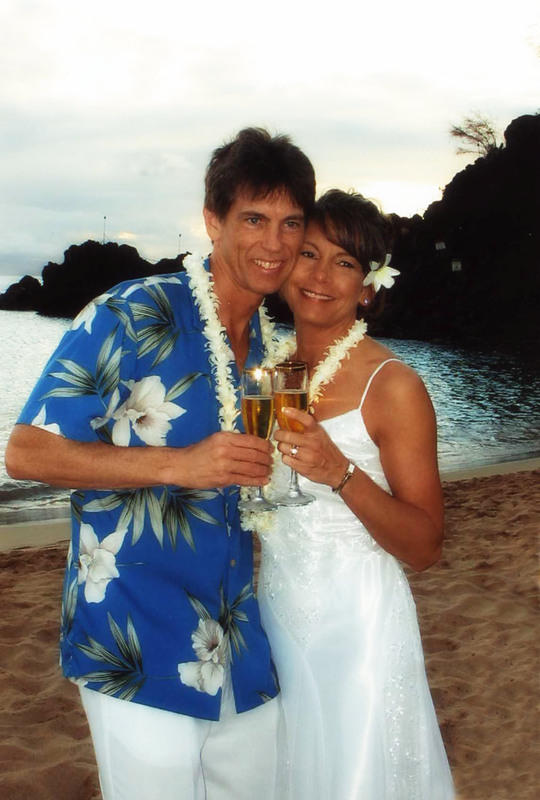 Congratulations to Drew Brown and his bride Shannon whom were married in 2006! .. This last January (2008) while visiting the island we decided we wanted to come meet the crew at MauiShirts.com. So we looked you up on the internet, and saw where it's by appointment only - and we were so fortunate as to get an appointment and get the red carpet treatment! We couldn't believe how many shirts, blouses, dresses, capri's you had in stock, and you and your staff were so kind to us thank you so very much! It was great fun, and we made great new friends! 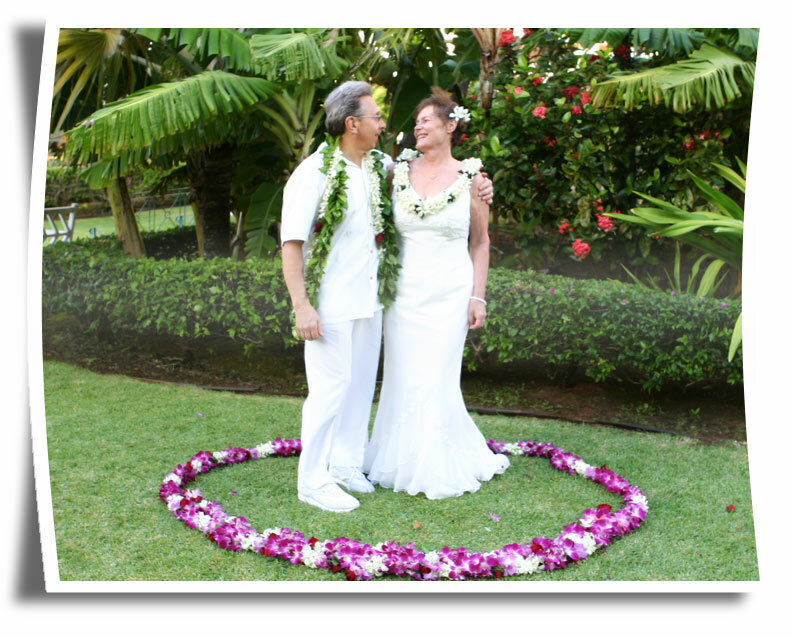 Mahalo, and we look forward to seeing you next March! 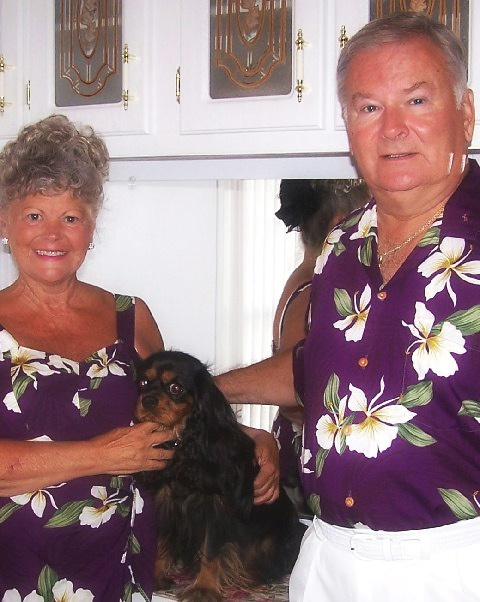 Matching family outfits in classic hibiscus. 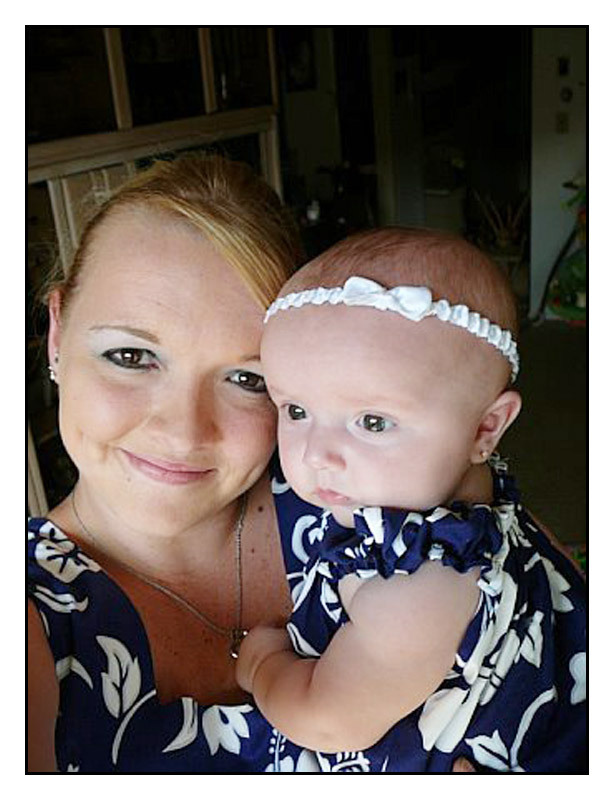 The daughter is wearing a 2 piece cabana set, and the mother is wearing a short tank dress. .. Also my daughter was such a hit I attached a couple pictures for you. Thank you again for being so speedy, you guys rock!! And the outfits were a HUGE hit!! 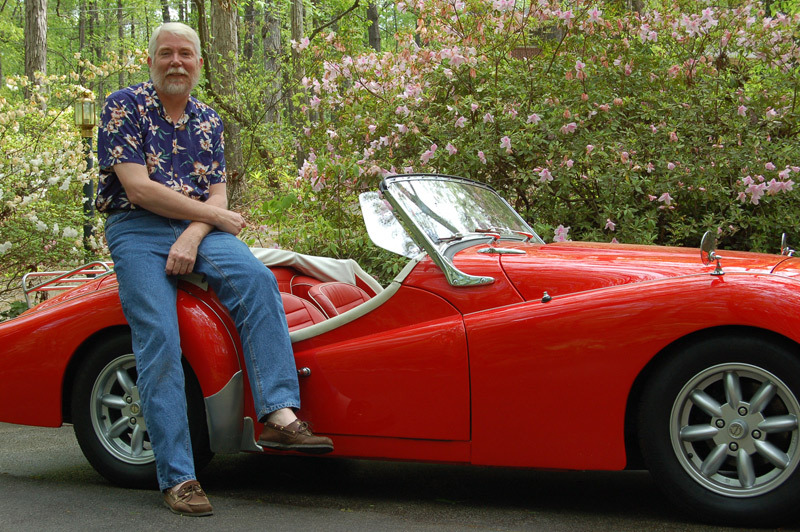 Mr Norway is wearing a Classic Hibiscus Men's shirt in red. A while back I bought one of your shirts, and I'm very very pleased with it. 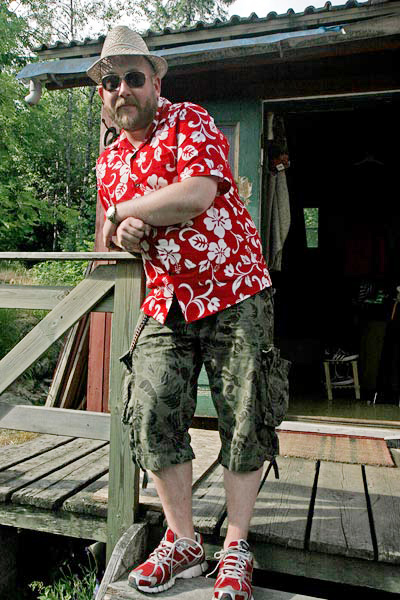 So I thought I'd send you a picture of me sporting my red hibiscus shirt at a cabin in the woods here in Oslo for midsummer's celebrations. 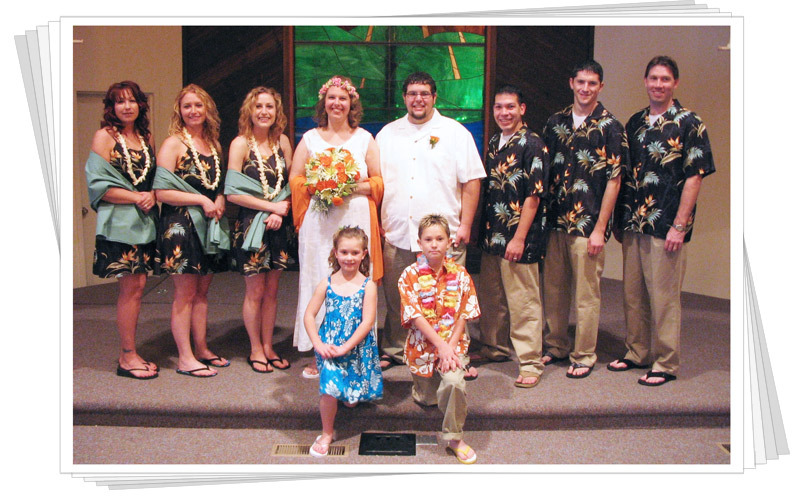 The Bride & Groom are wearing matching Wedding White Apparel prints. 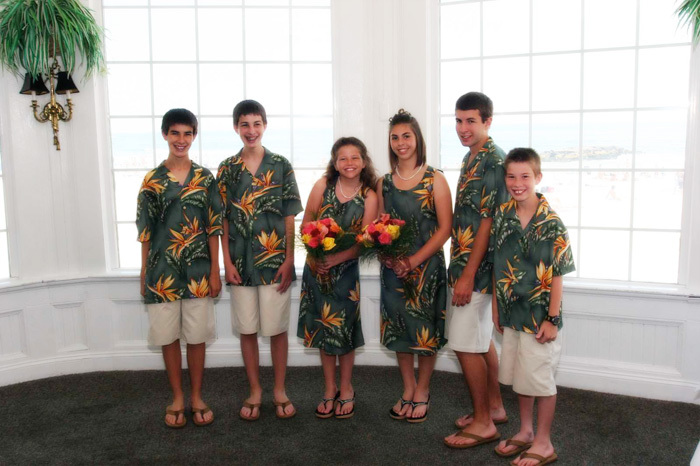 The Groom is wearing a men's Palm Trees shirt. 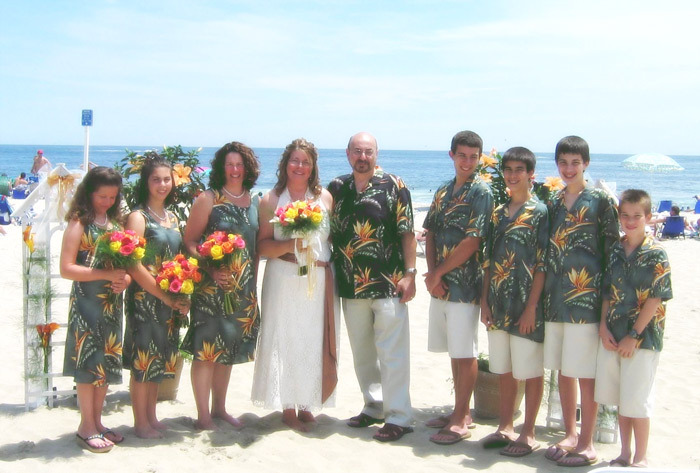 The Bride is wearing a matching women's Palm Trees long sun dress. Our wedding white Palm Trees were perfect! We've received so many compliments! Mr Lewis is wearing a Hurricane Cream with Green & Sand colored Palm Trees. Just want to thank you for your prompt & friendly service. 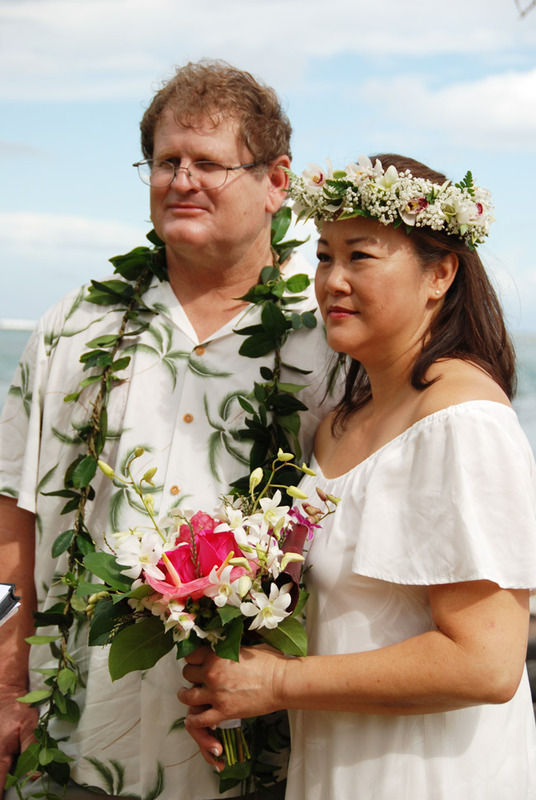 We were married on Kauai on December 6th, and your Hurricane Whites were the perfect touch for our beach wedding. After I received the wedding apparel, I immediately ordered another Paradise Found shirt for Wayne...the workmanship and feel of the clothing is AWESOME. 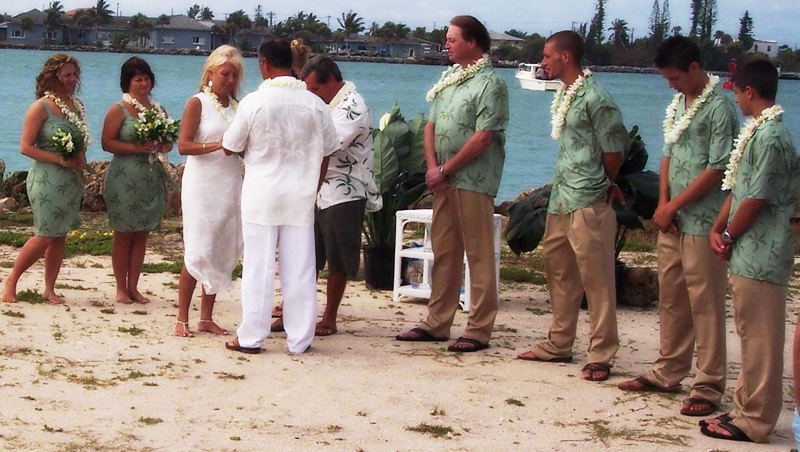 The Groom is wearing a Hurricane Wedding White with Palm Trees shirt. 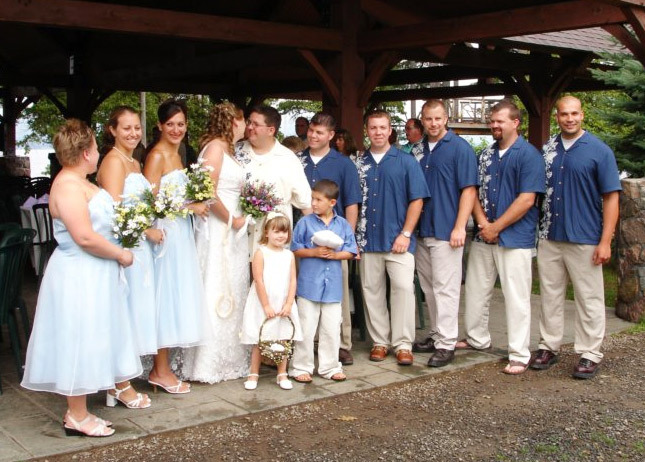 The bridesmaids and groomsmen are wearing matching Sea Breeze outfits in blue. 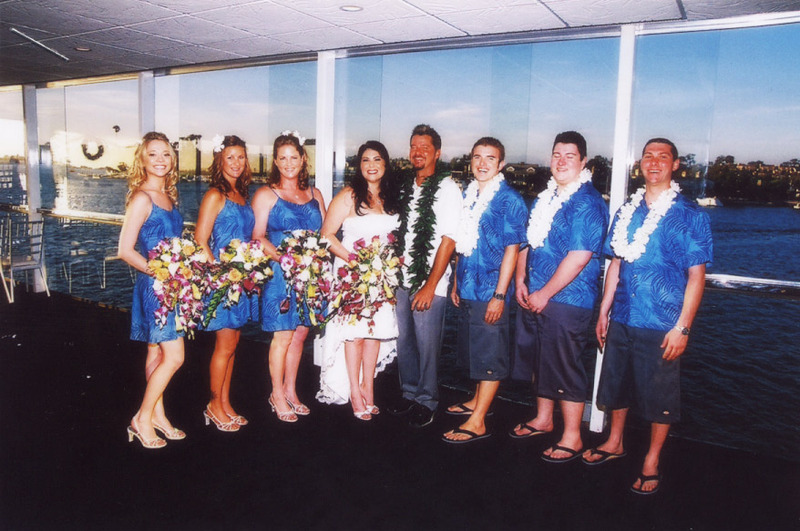 ... Everyone who was at the wedding commented on how great the wedding party looked! ...everyone received their orders with no problems. 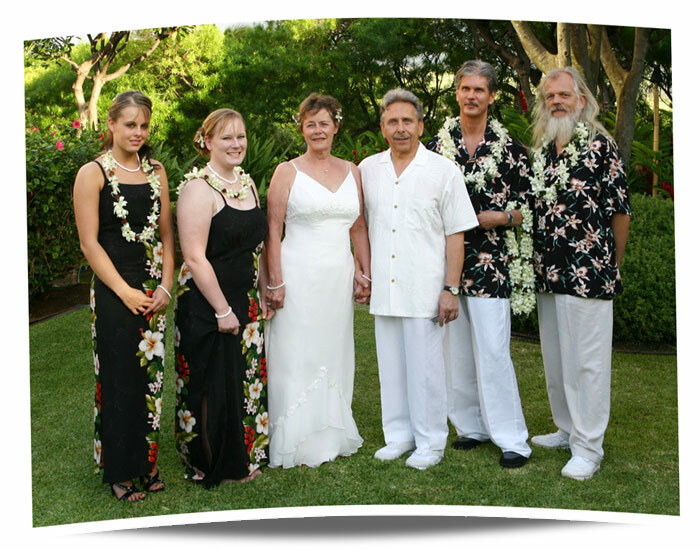 It was a relief to have such dependable service and quality garments for everyone. Thank you! 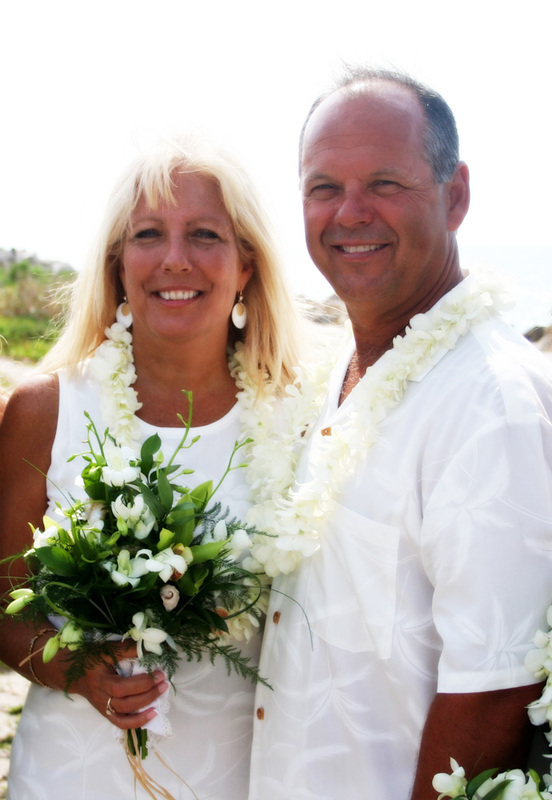 The Sperlings, are wearing matching Hurricane White prints for their beach wedding. 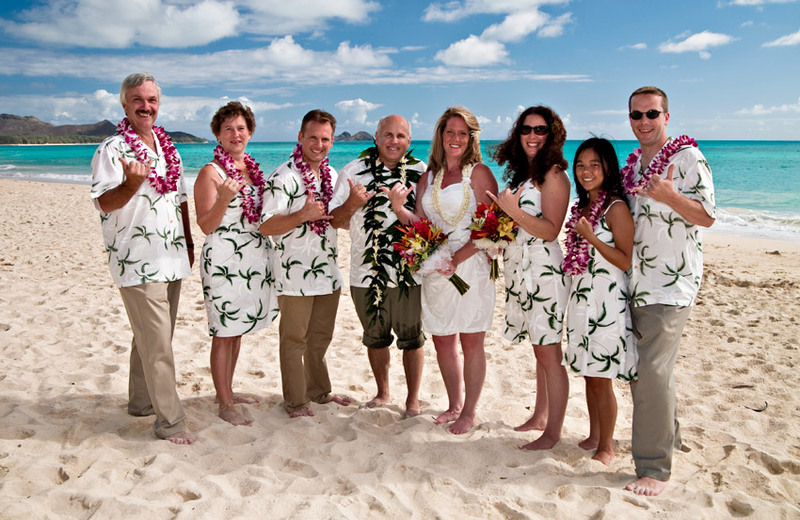 The Groom & Groomsmen, are wearing Men's Hibiscus Panel shirts. 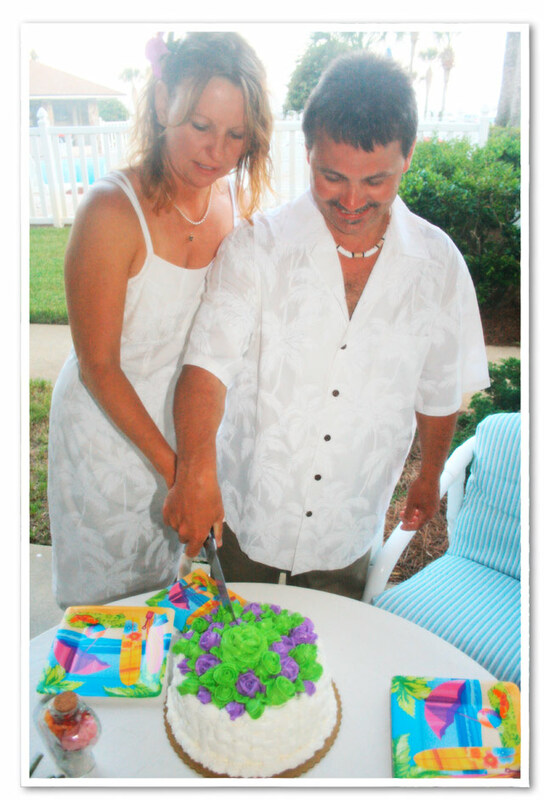 Hi Mickey, Well I just celebrated my 1st wedding anniversary on August 19th. One year ago I was running all around trying to find these hibiscus panel shirts of course at the last minute. I wanted to take a minute to thank you again for your help and super fast shipping. The shirts arrived the day of the wedding fresh from the cutting table. You definitely have a loyal customer in me. 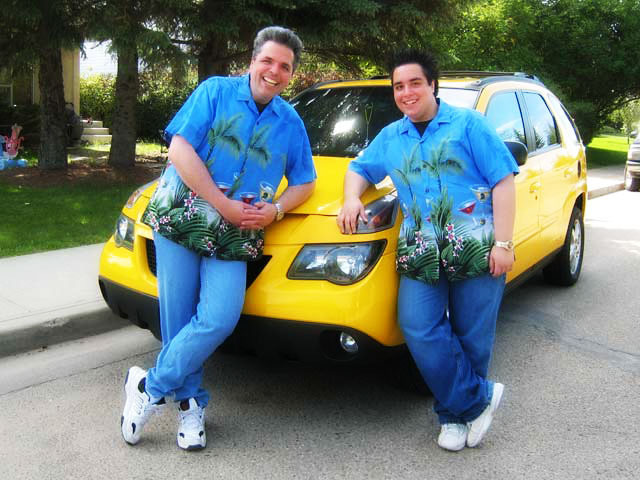 "This is a shot of me and my son Joe wearing Floating Martini Plumeria, in front of our bright yellow Aztek. Awesome!" Group photo of the FAMIS Sofware, Inc. 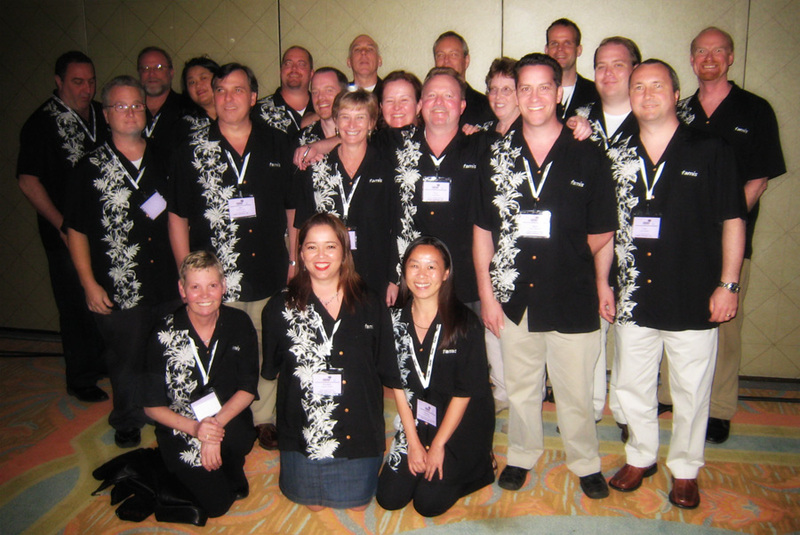 The group wearing an embroidered FAMIS logo of the Hibiscus Panel print. Congratulations Rudy and Dennis on your One Year Anniversary. The groom is wearing a Midnight Palm men's shirt. The groomsmen are wearing Star Orchid men's shirts. All the men are wearing white linen long pants. 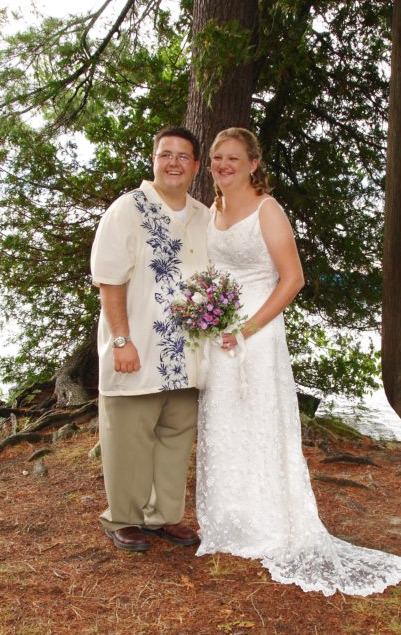 hurricane shirt and my groomsmen's shirts and pants complimented my wife's custom made dress perfectly. 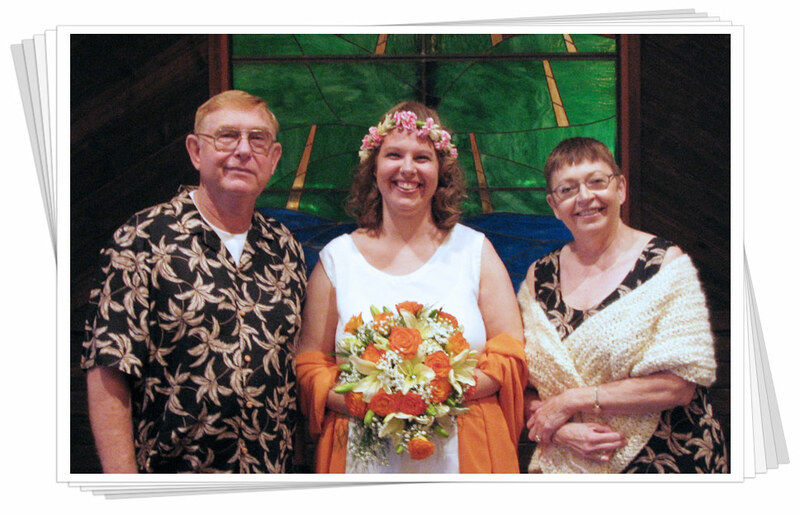 Fresh flowers from Kula, Pastor Sam Ahia, 25 family and friend, at the Kaanapali Beach Club gardens, and Maui Shirts. What more could anyone ask for? 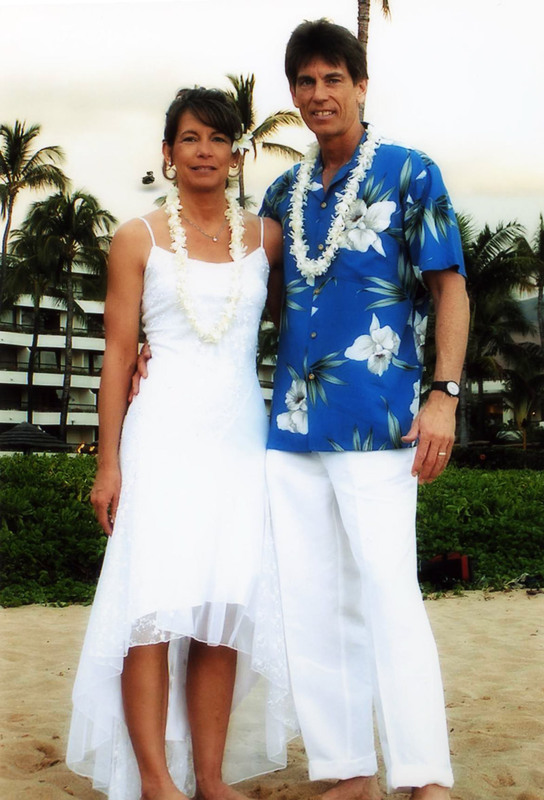 The Van Tassels , Thomas is wearing Watercolor Orchid in Periwinkle & White Linen pants. Russ Smith, wearing a Navy Blue Star Orchid print. 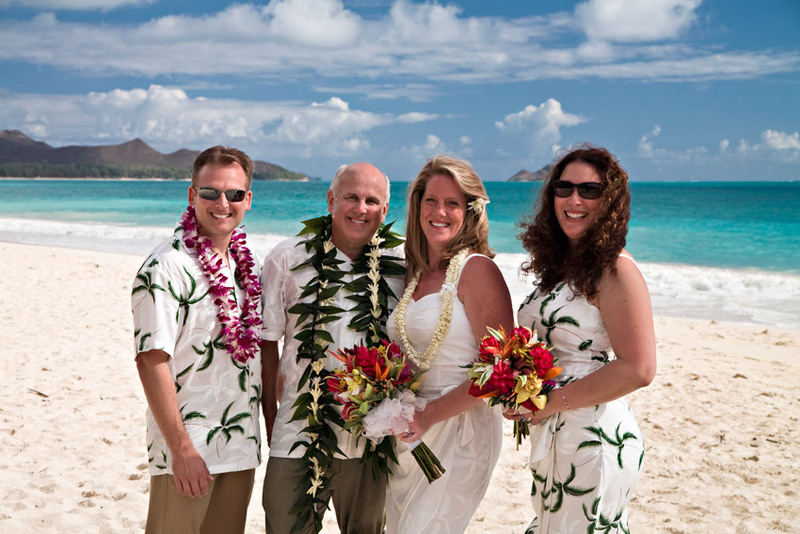 Allison Good & Husband, wearing Hurricane Wedding White prints. 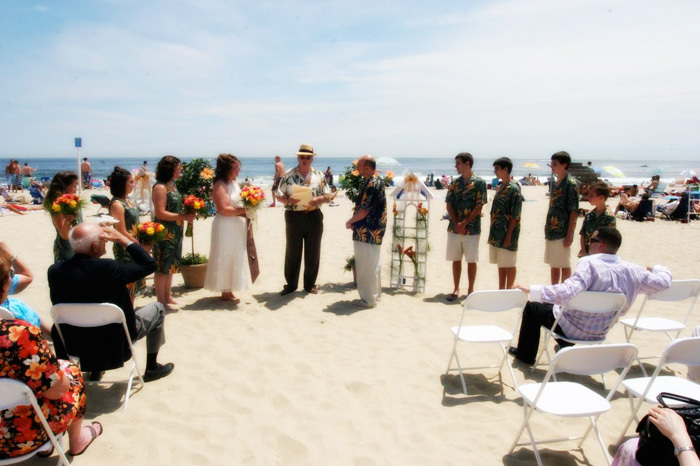 ...it really was the dress and matching shirt that "made" the beach wedding complete. I wanted to tell you Thanks for getting the shipment out on the very day I called and making this a priority. 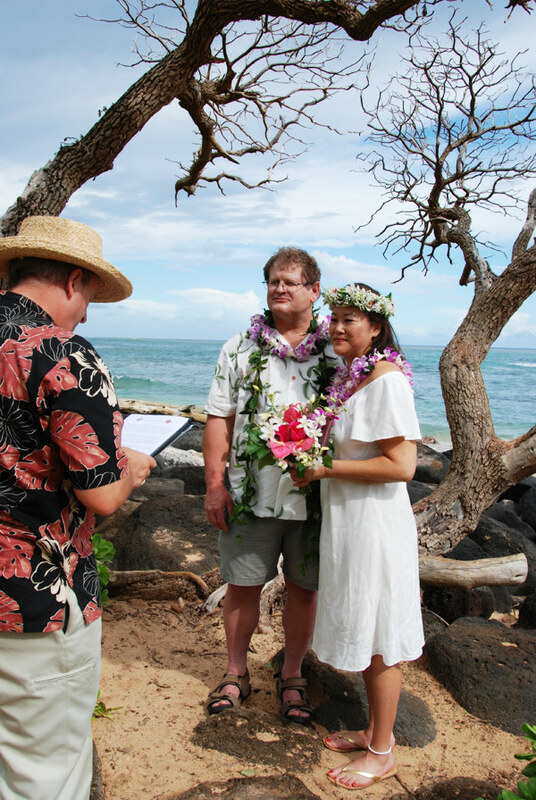 "I wanted to let you know that I was recently married and the groomsmen wore the Aloha shirt. The pictures were absolutely beautiful. I have attached a picture." 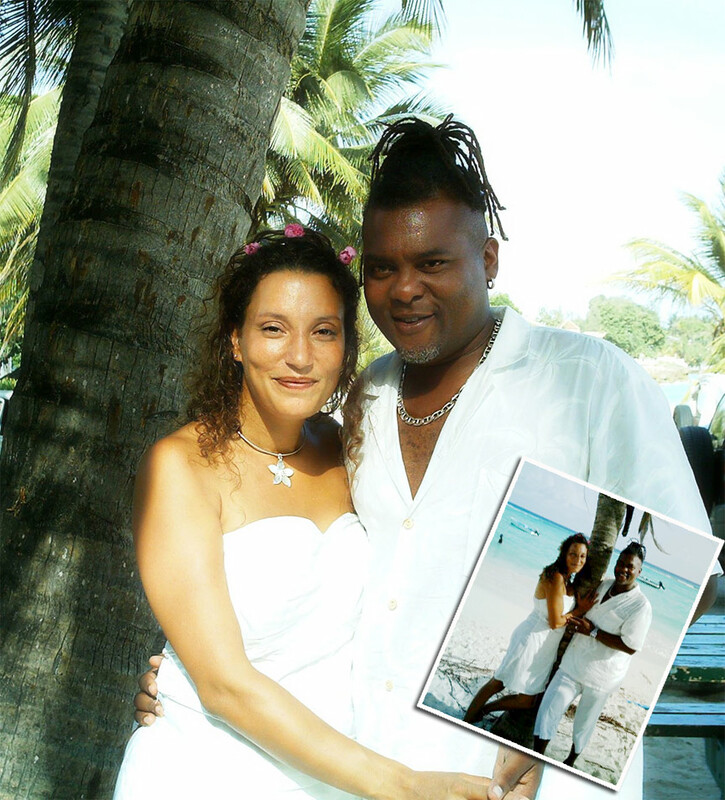 Just thought you'd like to see your products modelled at our fabulous Barbados wedding last year!! Thank you and my sister will be placing an order for her wedding soon!"